Showing all posts made in the month of December 2017. UQ Commendation Award for Collaborators of the Year! We have some exciting news! The BeUpstanding™ Team received a commendation award for collaborators of the year from the University of Queensland in the Faculty of Medicine. We are honoured that our hard work over the past year has been reconginised! We could not have done it without the participation and engagement of workplace champions and the support from our incredible industry partners (VicHealh, Queensland Office of Industrial Relations, Safe Work Australia, Heart Foundation / HeathierWorkplaceWA, and Comcare). We have been working hard and have exciting things planned in 2018 that we cannot wait to share with you! To be one of the first to know, sign up to our newsletter (at the bottom of this page). Pictured are just some of our Outstanding Upstanding team. 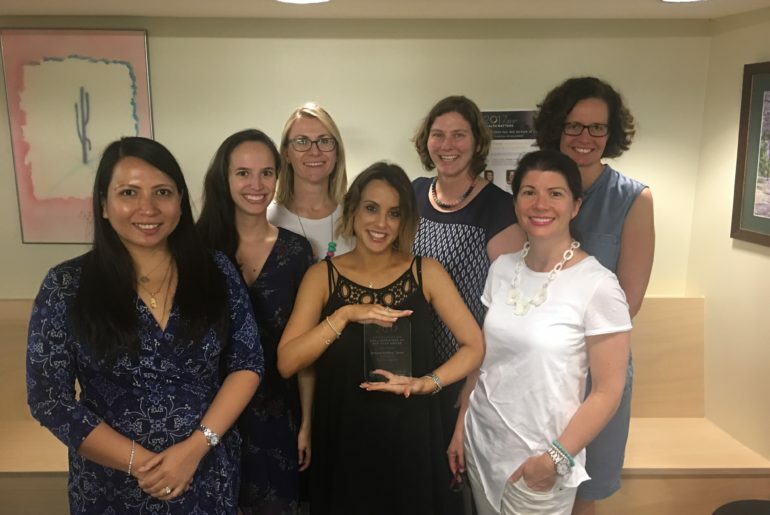 Image (Left to right): Genevieve Maher, Jennifer Warren, Brianna Fjeldsoe, Ana Goode (Program Translation Leader), Genevieve Healy (Principal Investigator), Anne Bannister, Sheleigh Lawler.